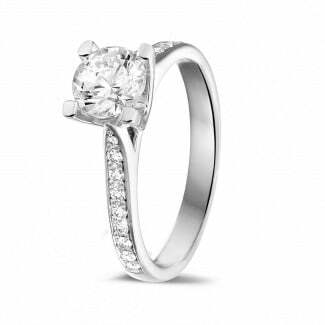 Are you getting engaged and would you like to surprise your loved one with an elegant white gold engagement ring? BAUNAT’s collection of white gold engagement rings is carefully made using only the best materials and has an excellent price/quality ratio. Apart from white gold, you also have the option of choosing other materials, such as platinum, yellow gold and red gold. Why should I choose BAUNAT? A diamond ring is the undisputed symbol of the lifelong commitment between you and your partner. 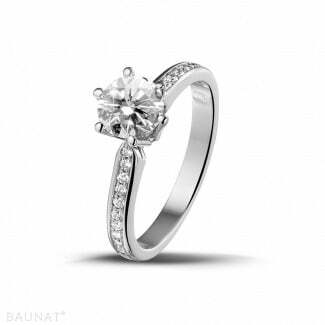 Each and every engagement ring from BAUNAT is handcrafted with high quality precious metals and diamonds. At BAUNAT, you can find an extensive collection of exclusive, high quality jewels, in many different shapes and sizes. But what if you cannot find what you were looking for? We also offer our clients the possibility of creating a tailor made, personalized engagement ring. Our experts will guide you throughout this whole process, from rough draft to finished jewel. Who can I turn to for advice? Choosing an engagement ring is not something that can be taken lightly. You need to think carefully about your partner’s personality and taste and use this as a base when you visit one of our specialized showrooms or contact us for advice. At BAUNAT, you can count on personalized and professional advice. 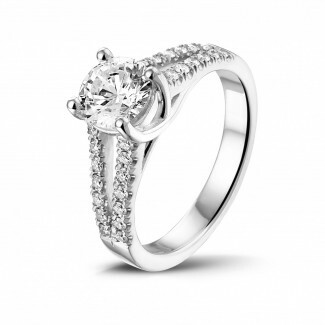 Can I buy white gold engagement rings online? 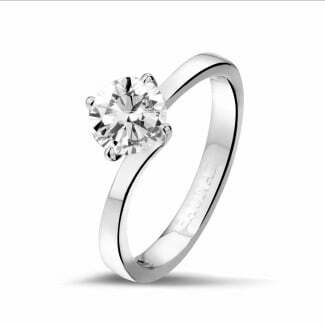 Are you confident in your choice and would you like to buy your engagement ring online, fast and simple? No problem! You can find BAUNAT’s complete collection of white gold engagement rings online and buy it with just a few clicks of your mouse. Buying online also means you can save up to 30 or 50% on the purchasing price. Moreover, we offer our customers free and insured shipping, as well as 30 days in which to change their minds. If your ring does not fully meet your expectations, you can exchange it hassle-free.